Did you know that weighing yourself in the morning is best? Stepping onto the scale can either yield pleasant results or not so pleasant results. Whether you enjoy checking your weight or not, chances are you might want to keep a watch on it from time to time. The good news is that there are a lot of great bathroom scales that don’t cost a fortune. We reviewed several different bathroom scales, and the one we liked the best was the RENPHO Bluetooth Body Fat Scale. We also found a couple of others that we noteworthy. Check out our top picks when it comes to great inexpensive bathroom scales. Helping you find a quality scale that doesn’t break the bank. If you are in the market for a new bathroom scale, there are a few things that you will want to keep in mind. One of the first things to consider is weight capacity. If you are heavier, then you may need to get a scale with a higher capacity. They usually range anywhere between 300 pounds and 500 pounds max limit. Another consideration that you will want to keep in mind is the measurement increments. Some scales, specifically those that just have a dial that turns when you step onto them, may only measure in whole pounds. There are some that give a more accurate weight, that measure all the way down to the tenth of a pound. Inexpensive scales don’t necessarily have to be “cheap” quality. 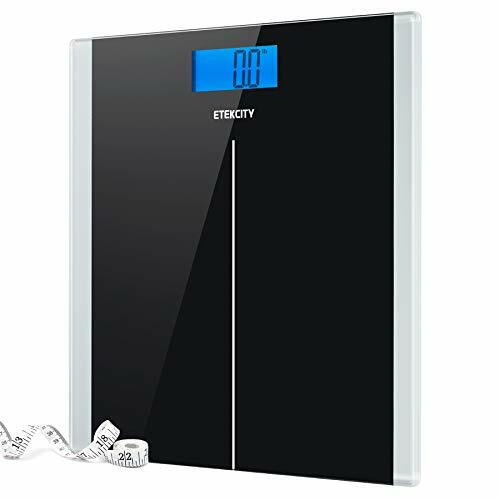 If you are trying to keep a watch on your weight and record your weight loss or gain, then you may want to consider a scale that has memory capacity. The ability to save weight data for one or more users makes it easier for you to keep track of your progress. Price is an obvious factor if you landed here, you are likely looking for a scale on the more affordable range of options available. While everyone has their own budget to keep in mind, considering that there are high-end blue-tooth scales with multiple user memory going for well over a hundred bucks, we think all our picks on this list would qualify as inexpensive to most shoppers. Finally, consider the platform. Scales with a larger platform are often easier to use, and they also tend to give a better reading since you are able to remain steadier. This scale really has a lot to offer, especially at the current price. It not only has an easy to read backlit display with multiple functions, but it also features step and read technology. This means that you can step on and get your weight instantly. It is also backed by a one year manufacturer’s warranty, and lifetime support. This isn’t all that this scale has going for it. Features high precision sensors, which means that accuracy is never an issue. It has a 12” platform that is made of a safe tempered glass. It is not only sturdy but also comfortable to stand on. It turns itself off after a few moments, so you don’t have to worry about your batteries going dead. It is kind of heavy, but this is due to the 6mm tempered glass. May feel a bit bulky compared to other bathroom scales. It does not have any built-in capabilities allowing it to keep track of your weight. It really is just simple to use a bathroom scale that gives accurate results, nothing fancy. Keeping track of your weight and other measurements are easy with this bathroom scale. It actually comes with an EatSmart tape measure so that you can not only track your weight, but also your inches. The manufacturer even has a no questions asked return policy if you aren’t happy with it. It features a large Accubright LCD screen, that is easy to see (even in dimly lit areas). This is thanks to the backlight. Weigh up to 400 pounds safely, without the bulk. It offers a slim design, with a large non-slip platform. It also offers 4 high precision sensors that give the most accurate reading, each and every time. This EatSmart Scale also made it on our shortlist of most accurate bath scales. This scale does not have additional features, such as body fat percentages or BMI. Doesn’t keep previous weight readings since there is no memory. Black numbers on the blue background can be harder to read for people with vision problems. 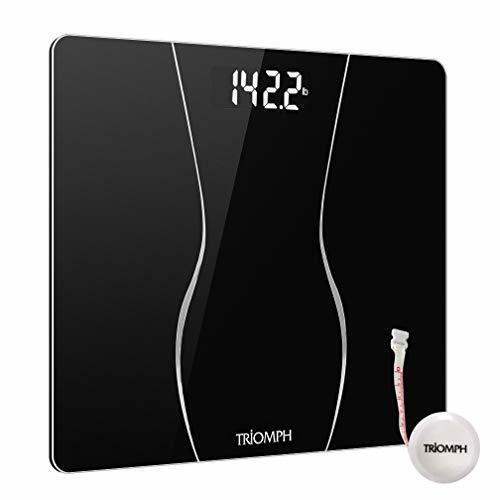 The Triomph Smart Digital Body Weight Bathroom Scale boasts of high-precision accuracy, within 0.2 lb. It has four sensors to provide accurate measurements. It can hold up to 400 lbs of weight. It comes in either jet black or pearl white, both of which are elegant and simple looks to fit your current bathroom decor. The numbers show up on an LCD backlit screen that has an easy-to-read display. The numbers are extra large, so you don’t have to squint while looking down. The surface is covered by a durable tempered glass. As soon as you step on the scale, it automatically calibrates and gives a reading instantly. It comes with non-slip and scratch-proof feet so that it doesn’t get out of place while you’re stepping on it. These are also designed to create no damage to your floors. It includes some innovative functions, too. These include the automatic on and off switch, which are triggered by sensors that know when you have stepped on or off of the scale. An auto-zero function also helps auto-calibrating in case multiple people need to check their weight. If the batteries are running low, or if there is too much weight for the scale to carry, there is a notification message on the screen. When low, simply replace the two AAA batteries. The product comes from France. Triomph is a renowned brand with 25 years of experience in the industry to back it up. You get a 30-day money-back guarantee and a 1-year warranty. The Innotech® Digital Bathroom Scale features a 3.6-inch display screen that’s easy to read – it is a negative LCD screen that is backlit. The scale has an overall modern and sleek feel to it. The color and design will definitely complement any bathroom decor. Once you receive the package, the scale is ready for use right away. It features an automatic zero-resetting calibration that makes it convenient. The scale’s surface is protected by a 6 mm tempered glass that is both shatter and scratch-resistant. It measures 12 x 12 inches and can fit in any bathroom and room. It uses German technology that has four sensors, giving readings accurate within 0.2 lbs. It can carry up to 400 lbs. If you have any reason to be unsatisfied, the item can be returned or refunded within 30 days. They also have local customer service, available 24/7. 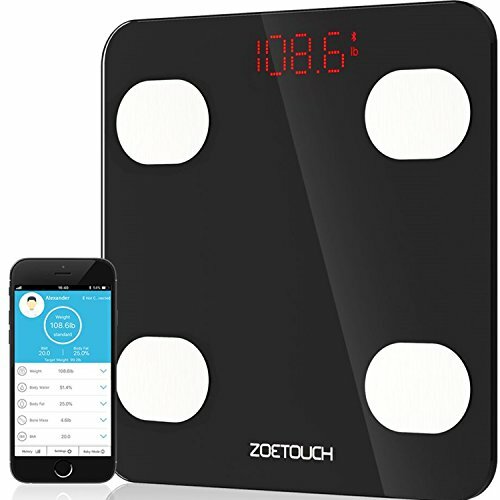 The ZOETOUCH Smart Digital Bathroom Weight Scale can be synced with your favorite fitness apps, such as Fitbit, Google Fit, or Apple Health. It can be connected via Bluetooth version 4.0, iOS 8.0, or Android 4.3 or higher versions. It uses the renowned bioelectrical impedance analysis (BIA) technology that gives it accurate readings. Its surface is equipped with highly-sensitive indium-tin oxide conduction (ITO) and four high-precision sensors, adding to the accuracy of the readings. It can carry up to 400 lbs. It shows readings in both kilogram and pound, in 0.1 kg or 0.2 lb increments. Be sure to open the accompanying app, which is available to download for free on the App Store or Google Play, directly on your phone. Follow the onscreen directions to connect to the scale. Make a measurement and see the data show up on your app. To get accurate readings, avoid moving while on the scale. Place on a hard, flat surface. It can measure more than weight. Check other health indexes, such as your body fat, body water, BMI, BMR, bone mass, visceral fat, and muscle mass. Up to ten users can use the same app and access their data seamlessly. The item comes with a one-year warranty. 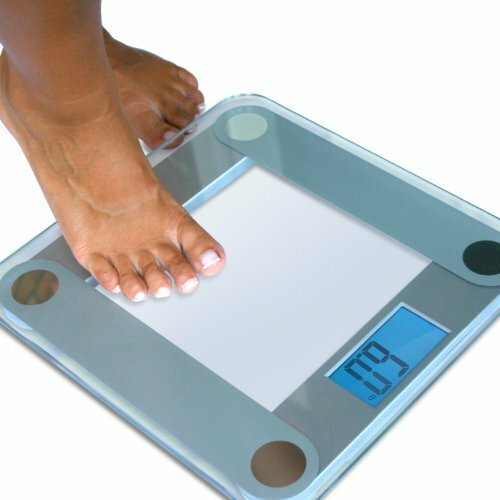 Rest assured because this scale is certified by the CE, RoHS, FDA, and FCC. 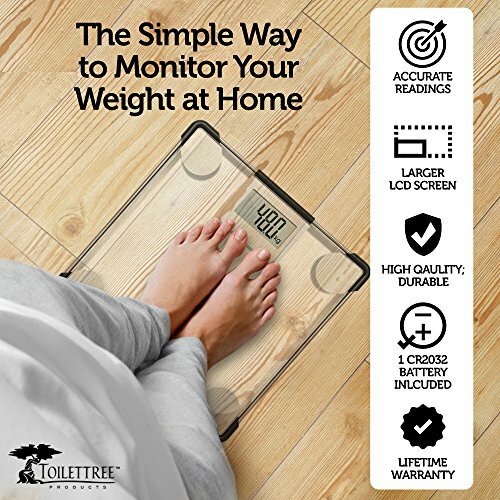 This ToiletTree Products Bathroom Scale isn’t just affordable: it’s highly functional as well. Let’s talk about appearance first. Its display has a huge and clear LCD screen. You can read it even without bending down. It is protected by tempered glass and has an overall sleek and modern design. It can fit any bathroom or home easily. It looks great as a bathroom accent, too. As for functionality, this is worth it, too. You can get a much clearer picture of your health using this tool. Find out how much weight you’ve lost, gained, or maintained. As soon as you take it out of the box, it’s ready to work for you. Batteries are already included. It uses four high-precision sensors that give accurate readings. It can carry up to 400 lbs and shows readings in both kilogram and pounds in 0.2 lb increments. Get a lifetime guarantee with this product, courtesy of ToiletTree Products. 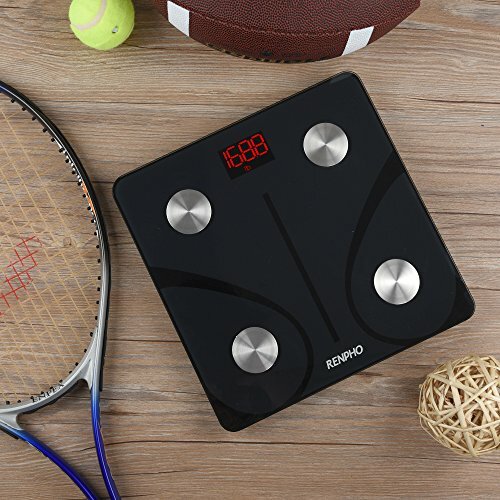 Now we get to our personal favorite, the RENPHO Bluetooth Body Fat Scale. This scale is like the Rolls Royce of scales, as it has a ton of added features that you can take advantage of. If you like techy devices, and like everything to connect to your mobile device, then this may be the scale for you. Smart technology allows this scale to sync to your fitness apps on your Apple or Android devices. Helps you to stay on track with your fitness goals. It measures much more than just weight. Measure your body mass index, body fat percentages, and more with this scale. Sync all data straight to your apps. It offers top-notch accuracy, to the .02 pound. Relatively inexpensive scale considering all the features. It will only display your weight directly on the scale. All other measurements must be viewed on the free app. It may not work on every mobile device. Be sure to check compatibility. Some consumers have reported that the battery life for this scale is not the best, and they often find themselves replacing batteries much more often than they did in other basic scales. 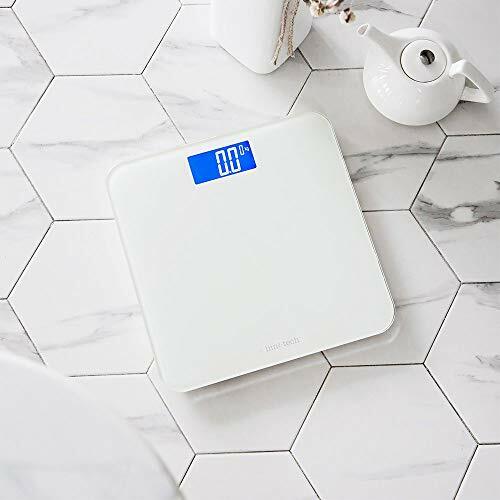 While we think that the RENPHO Bluetooth Body Fat Scale gets the highest score when it comes to the best affordable bathroom scales, it doesn’t mean that the others don’t measure up in quality. The main reason that we love this one is that it can sync to your phone to help you keep all of your fitness data in one place while giving the most accurate measurement down to the .02 pound. All these features are unusually in such an inexpensive scale. The scale also has nearly a 400-pound weight capacity. That means it is suitable for almost anyone.